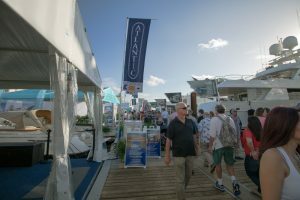 Come visit us at the 2016 Fort Lauderdale International Boat Show! : Atlantic Yacht & Ship, Inc. The 2016 Fort Lauderdale Boat Show has begun and if you are in the market for a quality used motor yacht for sale, be sure to come and visit us at the 2016 Fort Lauderdale Boat Show. Fort Lauderdale, Florida, the “Yachting Capital of the World,” will host the 57th 2016 Fort Lauderdale Boat Show on Nov 3-Nov 7, 2016. Show exhibits range from yacht builders and designers to exotic cars and brokerage yachts. A wide variety of boats will be on display including runabouts, sportfishers, high performance boats, center consoles, cabin cruisers, flats boats, skiffs, express cruisers, sailing yachts, motor yachts, bow-riders, catamarans, ski boats, jet boats, trawlers, inflatables, canoes, and extraordinary superyachts. We have 15 beautiful used motor yachts for sale on display. This is exactly where you want to be! This year, this 2016 Fort Lauderdale Boat Show will feature an instructional powerboat school. Nothing beats hands on experience when it comes to improving your boating skills and learning new ones. This year add more fun and excitement to your boat show experience and take your boating skills up a notch. There’s something for everyone – from absolute beginners to seasoned skippers! So if you are coming by the 2016 Fort Lauderdale Boat Show be sure to stop by and say hi at our display!